In 2019, Democrats are projected to have a majority in the House of Representatives, while Republicans will have an increased majority in the Senate... Democrats have taken over the governorships of Illinois, Michigan, Maine, New Mexico, Wisconsin, Kansas, and Nevada, substantially increasing the number of Democratic governors... Although Republicans increased their Senate majority by defeating Democratic Senators Joe Donnelly, Claire McCaskill, Heidi Heitkamp, Democrats were able to take out Dean Heller in Nevada, cancelling out one of those gains... Democratic Senator Jon Tester was able to survive in Montana, overcoming a challenge from his Trumpian opponent Matt Rosendale... Bill Nelson's race with Rick Scott is headed to a recount in Florida, with Nelson trailing. Be aware that these are unofficial results and will change as ballots continue to be tabulated. Data is provided by the Washington Secretary of State and county elections officials. BALANCE OF POWER: Who will control the Washington State Legislature in 2019? Data is provided by the Oregon Secretary of State and county elections officials. BALANCE OF POWER: Who will control Oregon's Legislature in 2019? 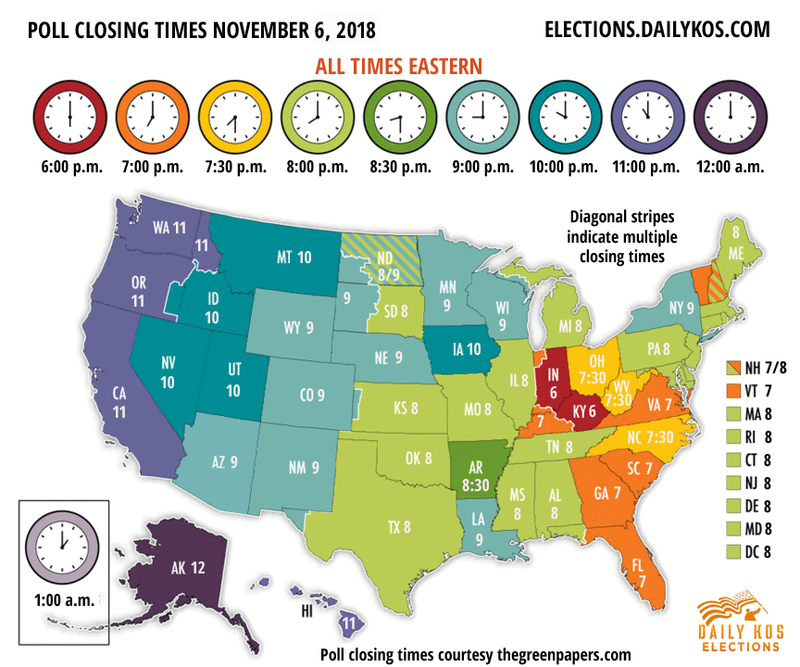 Courtesy of Daily Kos Elections and The Green Papers (which supplied the source data), here's a map of poll closing times across the nation today. Note Washington, Oregon, and Colorado are vote-by-mail states that do not have polling places except for accessible voting centers. All times are Eastern. © 2018 The Northwest Progressive Institute, a netroots-powered strategy center working to raise America's qualify of life through insightful research and imaginative advocacy.